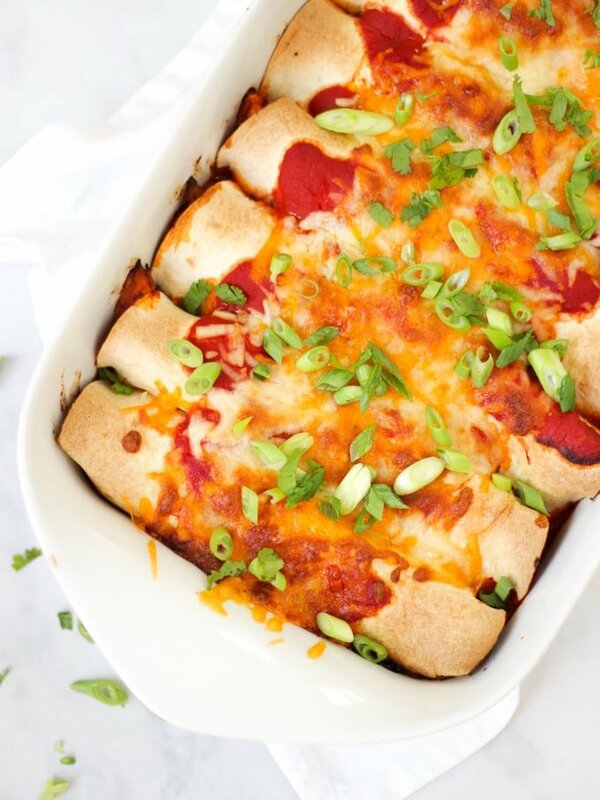 This Easy Chicken Enchiladas recipe is a delicious and tasty midweek dinner. 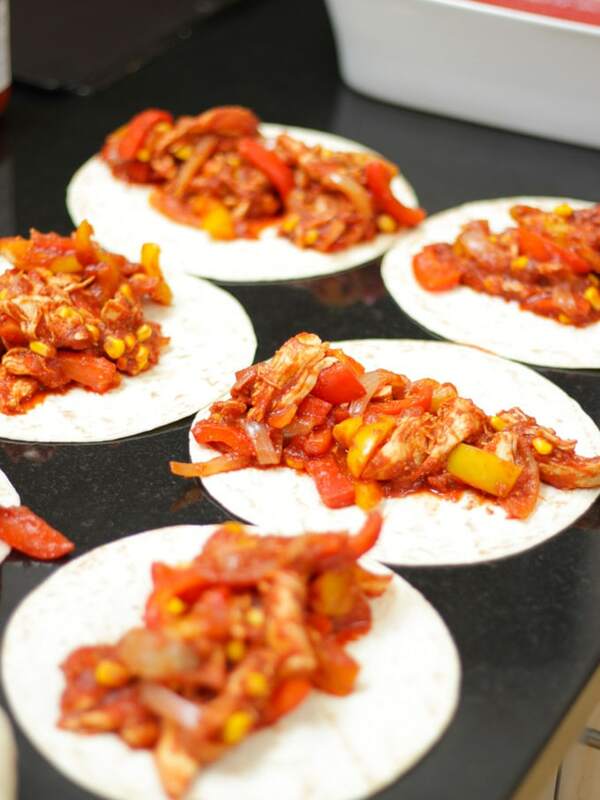 This recipe uses shredded chicken, lots of vegetables to keep it healthy and a tomato based sauce, all rolled in your favourite wraps and topped with cheese. 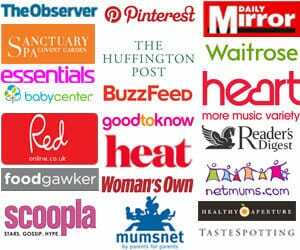 It’s also super easy to adapt to be Slimming World friendly. Oh hi favourite midweek meal of the moment! 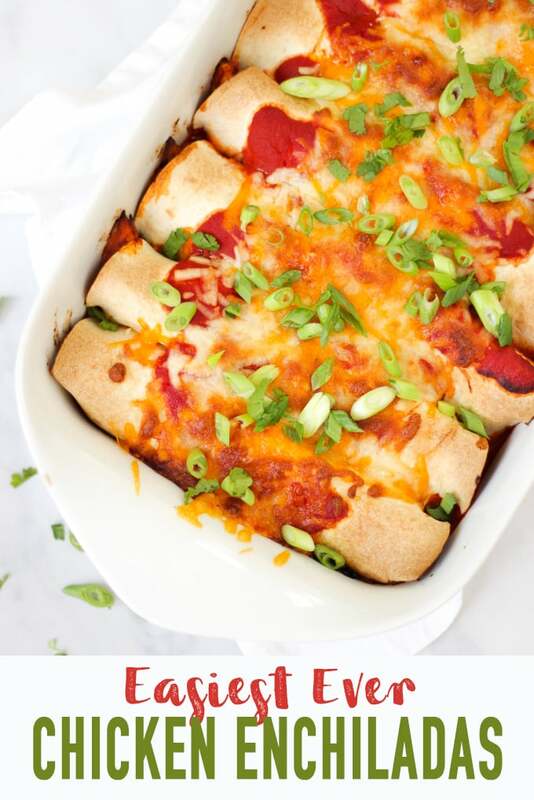 We’ve eaten this dish a few times over the last few months whilst I’ve been getting it just right and we still haven’t tired of this Easy Chicken Enchiladas recipe. There’s a tendency to avoid spicy foods for children (just me? I can’t face the complaints!) but I’m often surprised by how much of the hot stuff they’ll actually enjoy. So, to make this suitable for families, I tested this sauce with less chilli powder. But we finally ended up as this version, I hope we’d hit just the right note for enough taste to keep everyone happy. Honestly, I have no idea how authentic this recipe for Chicken Enchiladas is (not very I’d guess). But I think, like fajitas, it’s one of those dishes that have become (or possibly in the UK are becoming) a regular feature. I’m not desperate to be too authentic, as long as it’s delicious and everyone enjoys it – who’s with me?! 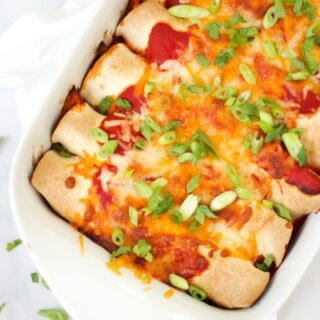 How do you make Chicken Enchiladas? 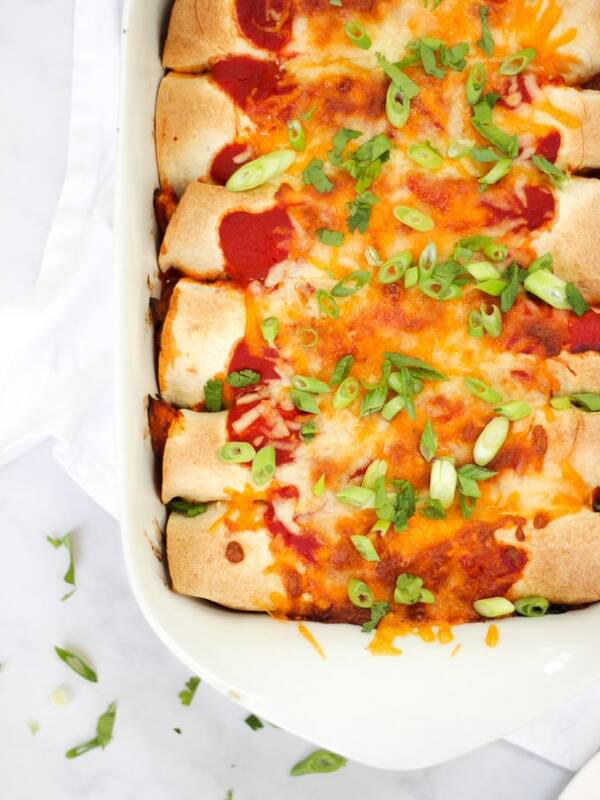 You make these Chicken Enchiladas by adding cooked chicken to a spicy sauce with vegetables, wrap them in tortillas, and top with a little more sauce and some cheese, before putting them in the oven to heat through. 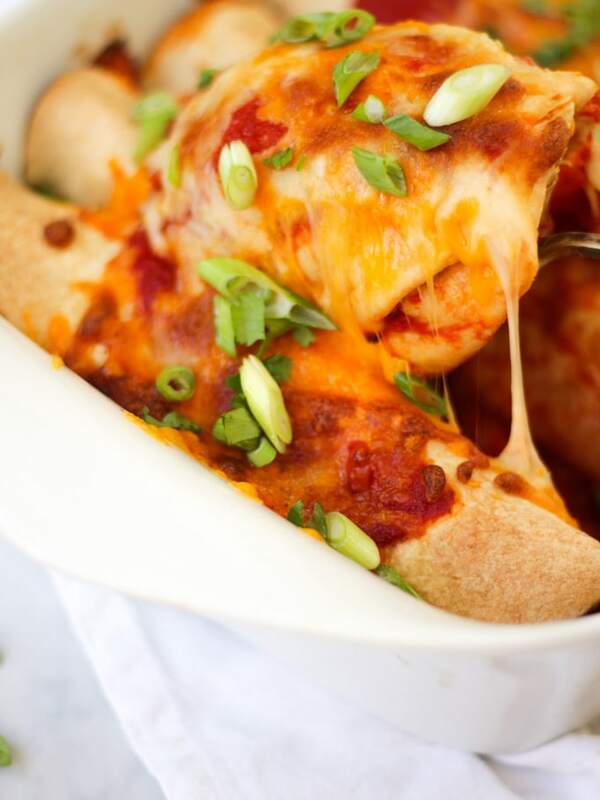 They end up soft and delicious inside, with a crisp cheesiness on the outside. What is in a Chicken Enchilada? Enchilada sauce, piles of peppers, onions (in the sauce) and of course shredded chicken fill Chicken Enchiladas. I also like to add some sweetcorn to flavour and bite. You can vary the fillings and add in whatever your favourite vegetables are. How do you make homemade Enchilada Sauce? Lots of enchiladas sauces are made without tomato, often with stock (broth) and flour. This recipe uses a tomato based sauce to increase the vegetable content. It also makes a super tasty and easy sauce. 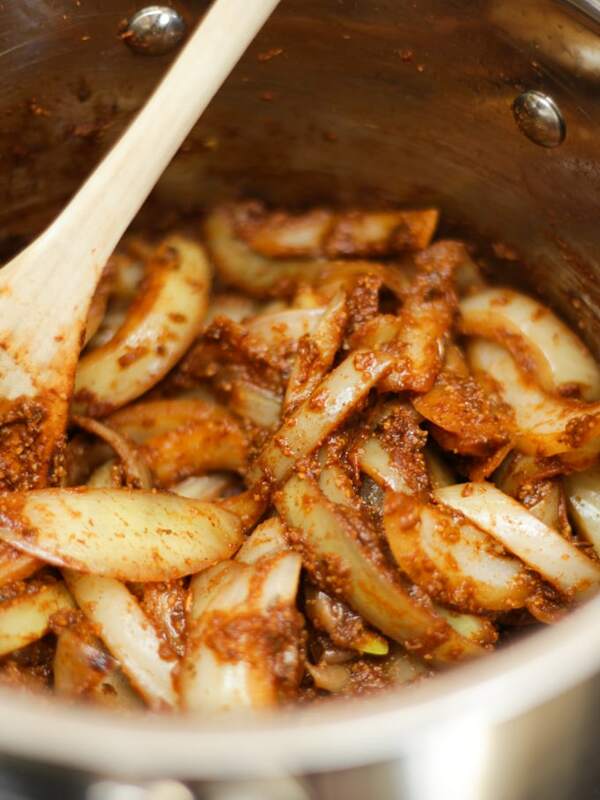 Onions and cooked spices make a really tasty base for the tomato enchilada sauce. How do you cook chicken to be shredded for Chicken Enchiladas? This recipe for Chicken Enchiladas specifies cooked, shredded chicken. You can use leftover cooked chicken, or the meat from a Rotisserie chicken. If you don’t have any cooked chicken, just buy the same weight in chicken breasts raw, and as you make your enchilada sauce, cook them in a another pan. I like to cook them for shredded chicken by boiling them in a pan of water for about 25 minutes, this keeps chicken breasts super moist. Which tortillas should you use for Chicken Enchiladas? Use whichever type of tortilla you prefer, if you’re using very small (mini) ones you may need more than the amount specified in the recipe. Corn tortillas work really well (available from Ocado) or if you’re following the Slimming World plan, just substitute in a wrap that is specified as one of your Healthy Extras. Sometimes I use wholewheat wraps for this too to increase the fibre content. Yes! 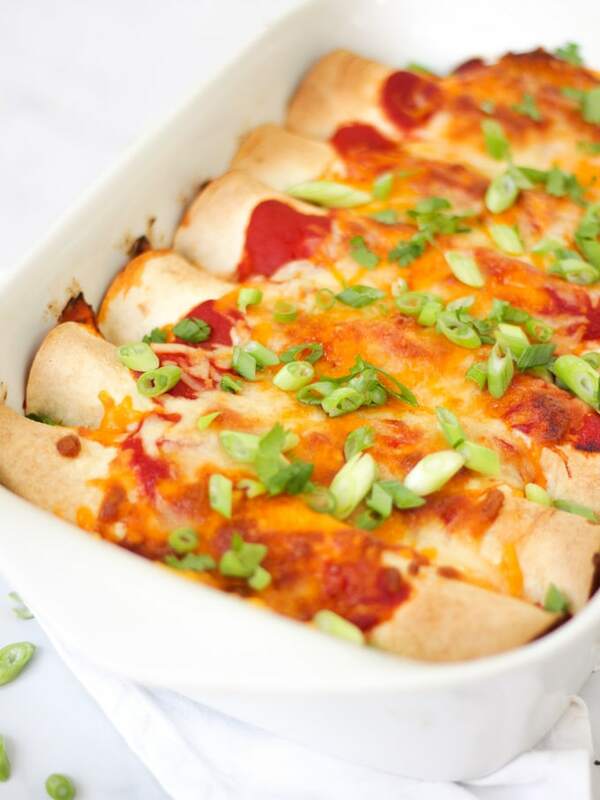 Chicken Enchiladas freeze really well for an even quicker meal on busy evenings. Just cover well and freeze before baking. The tortilla wraps can go a little bit softer than when cooked on the same day. This isn’t the end of the world, but if you do want to avoid this, just freeze the sauce/filling and then assemble the defrosted filling with fresh wraps on the day you want to serve them. I like to use a mixture of Mozzarella and Red Leicester cheeses to give good cheeeeeeeseyness (def a word right?) and also a lovely golden colour. This Chicken Enchilada filling also works really well with rice or as a pasta sauce instead of in the tortilla wraps. I like to briefly fry my pepper (capsicum) pieces before adding to the sauce. This isn’t necessary, but I just like the slightly smoking flavour that charred edges give. Fancy some other easy chicken recipes? How about my One Pan Chicken Pesto Bake or my Slow Cooker Chicken Cacciatore? 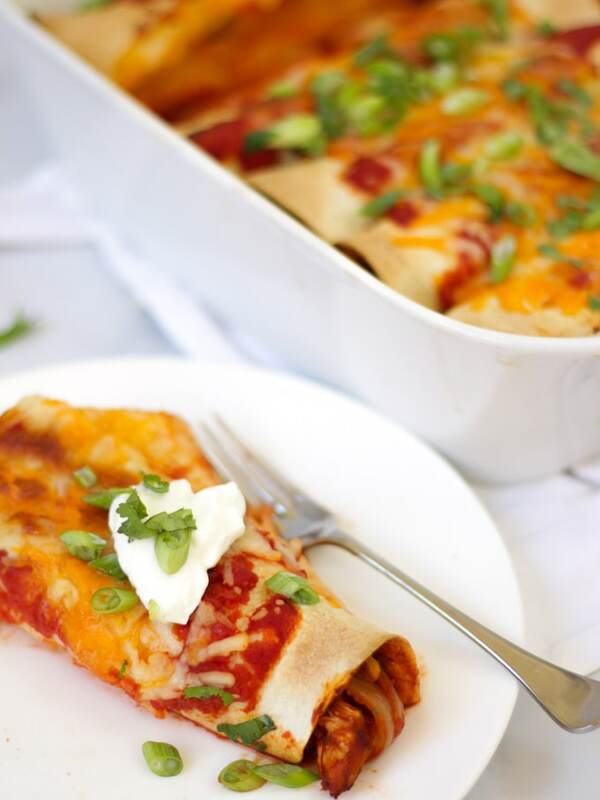 This Easy Chicken Enchilada recipe is a delicious and tasty midweek dinner. This recipe uses shredded chicken, lots of vegetables to keep it healthy and a tomato based sauce, all rolled in your favourite wraps and topped with cheese. Heat the olive oil in a large saucepan and add the onions, garlic, cumin, oregano and chilli. Cook for about 10 minutes on a low heat until the onions are almost cooked through, coloured and fragrant. 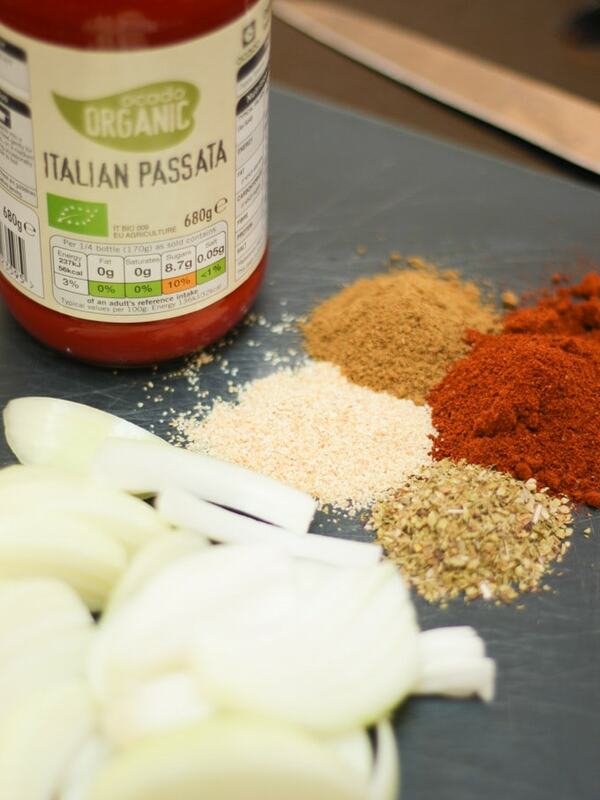 Add in the passata, turn up the heat to medium, put a lid on the pan and cook for a further 10 minutes. Remove two large spoonfuls of the sauce to a bowl and put to one side (this is for underneath and on top of the rolled tortillas). Remove from the saucepan from the heat and add in the chicken, sweetcorn and peppers. Mix thoroughly and if you have time, allow to cool a little so it's easier to roll the tortillas. Lay the tortillas out and share the mixture evenly between them. Put half of the reserved sauce on the base of a baking dish and spread out. I made these tonight for the first time and my fussy children ate it all and asked for seconds!